November 19, 2012  For many years, what you call the Southeast Asian nation has mattered to many. 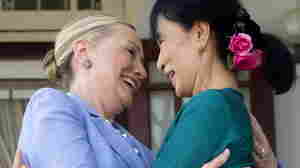 Referring to it as "Burma" has been seen as a show of support for democracy activists. There have been major reforms there, though. And today as a "diplomatic courtesy," the president also used the name "Myanmar." November 6, 2012  Southeast Asia has been a hot spot for drug-resistant malaria in the past. Now researchers in Thailand worry that a superstrain resistant to the last, best malaria treatments could undermine progress made against the mosquito-borne disease. October 26, 2012  Rakhine Buddhists and Rohingya Muslims, who are not Myanmar citizens, are separated by the Myanmar government, but still find ways to fight each other. 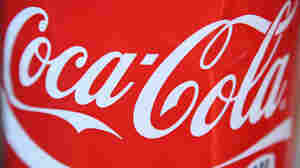 June 15, 2012  With the country also known as Burma taking steps toward democracy and respect for human rights, Coke is returning after a 60-year absence. What are the two nations where it still won't be doing business? 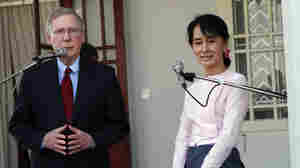 January 26, 2012  McConnell was the architect of the sanctions against Myanmar and over the past few months, he's seen country race toward democracy. November 4, 2010  Myanmar has been facing a Distributed Denial of Service attack for about a week, bringing its networks to a near standstill. It's unclear why, though the country does have elections this weekend. 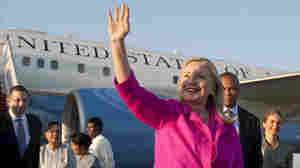 Elections that critics say are a sham. Burma or Myanmar: Which Is It?